Ireland has seen a massive increase to our independent start up breweries in recent years. 2013 was a bumper year for brewery openings but I suspect 2014 will be even better. At the recent Winter Ales and Cask Festival held in the Franciscan Well in Cork, a number of those new start up breweries were there with their beer and also held talks to give people the background of themselves and how they got started. I'd like to mention a few of those new breweries here now as ones to look out for this year. I'm only picking 4 new breweries for this article. Please don't take offence if you are not mentioned. 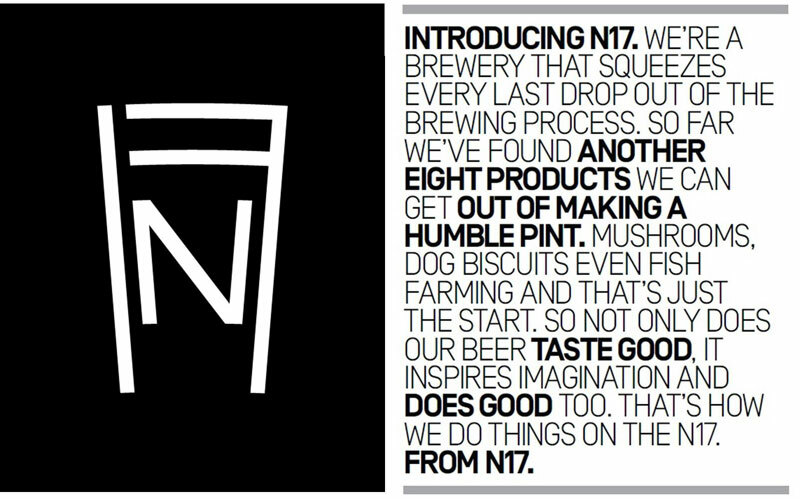 N17 is less about being a brewery and more about being a story. Started by Sarah Roarty, the whole ethos of the brewery is along the lines of "why stop there?" The brewing process can spawn a number of other industries with its by-products so why not do that? Everything from mushrooms to dog biscuits. Sarah won a bronze medal at the recent Dublin cup for her awesome oatmeal stout. The reason I think that N17 deserves to be watched closely is that Sarah is the ultimate go getter. She knows what she wants and she will do almost anything to achieve her goal. When Cathal and Emma won the NHC Summer Session Beer competition last year, they won the opportunity to brew full scale at the Brú brewery in Trim. I was a judge at that competition so I know the beer was good. Myself and Emma went on to judge another homebrew competition at the Twisted Pepper later that day in which Emma had to step down when her beer was put through to the best of show by the other table. Wouldn't you know it, they won that one too with their ginger porter. The beer they brewed commercially, first with Brú was the ginger porter. In the recent Dublin cup they won a bronze medal for this beer but interestingly, they entered a chocolate ginger porter too and that won gold! One of three gold medals won by Irish breweries at the event. I haven't had the pleasure of that one as it hasn't officially been released but it sounds delicious. I expect interesting things from Cathal and Emma and their Rascal's Brewing. Black's of Kinsale is also one to watch and for a number of reasons. Slightly more established than the other two, they really only launched in the second half of 2013. Regular followers might recall that I organised a crowd-fund chip in via Beoir and we raised €2000 for Sam. In return, apart from the warm fuzzy feeling of helping in setting up a new Irish brewery, we all get to go to Kinsale next weekend and brew a big double IPA. Once finished, we all get 20 bottles of the beer and the leftover goes on sale so we will have bragging rights in the pub too. Sam changed his branding to a much bolder style than when he initially launched. It's more more in keeping with the bold flavours Sam uses in his beer. Black's recently launched a double IPA at the Franciscan Well and it was very moreish. The one we will be brewing with him will be a little bigger at 9% versus his 8% and with some interesting hops such as Topaz. Sam's capacity allows him to contract brew for start up breweries which is how he got started by brewing at the 8 degrees brewery so he is certainly one to keep an eye on. Oh and when the Beoir collaboration brew comes out later this year, make sure you buy some. It will probably be expensive as it's a rather big beer but it will be worth it! If you find yourself in Cork, you could do a lot worse than to veer away from the city centre and head in to the suburbs of Mayfield to the Cotton Ball pub. The pub itself has been in the same family since 1874 but only recently put a microbrewery in to it. I haven't been in myself but The Beer Nut was there for the launch last month. Here's his report but it seems to be a thumbs up for the beer. I'll have to get along there myself. Speaking of Cork, The Franciscan Well brewery may now be owned by Molson Coors but owner Shane Long is still doing his best for the little guy. He made a point of featuring them at the Winter Ales And Cask Festival and is also running workshops* to help them make the most out of things such is installing lines/taps in bars etc. Shane helped pave the way for the Craft Beer Revolution in Ireland as one of the original of the resurgence in the 90s and especially in the last 5 years and now that his own breweries financial future is secure in the Molson Coors family, he still has time to help new start up breweries. It's for dedication like this that I requested him to be a keynote speaker at the Beer Bloggers Conference in Dublin this June. * For info on these workshops, I suggest contacting the brewery or perhaps Beer Ireland who work closely with the brewery as it's also the location of a brewing course which has resulted in many of the new breweries opening at the moment. Their brewery map is also worth taking a look at.